Metropolitans, counties and regions are combining resources to improve public safety communications systems. This type of collaboration illustrates the evolution of public safety communications from individualized systems to consolidated systems. Within this framework, consolidation refers to a merger of two or more public safety dispatch centers (PSDCs). Today, consolidated PSDCs are progressively significant and extensive due to budget restrictions, emerging technology, federal regulations and the emphasis on emergency response interoperability since Sept. 11, 2001. Consequently, PSDCs are transforming into multifaceted agencies responsible for 9-1-1 services and radio communications for multiple emergency agencies within a region. 1. Recognize that consolidated PSDCs necessitate network governance. Stakeholders should understand the multitude of relationships between all agencies in the collaborative PSDC network. For example, if a PSDC stakeholder (i.e., police or fire department) changes an individual agency policy related to radio communication, they need to consider the impact of that change on every other stakeholder involved. Many consolidated PSDCs create a user or stakeholder advisory committee to facilitate this type of network governance. 2. Strengthen the network by building processes to overcome any individual agency barriers. Jane Fountain, as stated in her guidebook Implementing Cross-Agency Collaboration: A Guide for Federal Managers, advises that stakeholders in collaborative networks need to “build capacity across boundaries through rigorous structures and processes with the extra commitment and coordination required to work across agency boundaries.” Specifically, once stakeholders construct their PSDC network, the job is not complete. The creation of processes to permeate cross-agency barriers or solve cross-agency problems will augment transparency, accountability and responsiveness. For example, if a stakeholder places new demands that produce additional costs for a consolidated PSDC, a process should be in place for PSDC management to easily request or receive additional funding to cover the costs of such demands. Or, alternatively, PSDC management may be able to deny new demands or suggest alternative solutions without fear of ruining any stakeholder relationships. 3. Promote involvement in networks by highlighting key benefits. Robert Agranoff, in his Public Administration Review article titled “Inside Collaborative Networks: Ten Lessons for Public Managers,” outlines several value-added network benefits including stakeholders garnering enhanced collaborative skills, agencies acquiring more and better information, stronger inter-agency processes and measurable results. Not all consolidated PSDC stakeholders will immediately see the value in nurturing their network, especially if their network involvement is not voluntary. Active stakeholders need to entice others by emphasizing the value-based benefits. 4. Embrace the flexibility of a network. 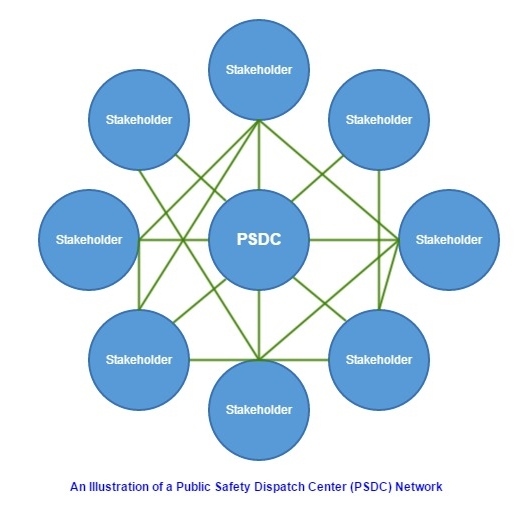 Within the context of consolidated PSDCs, a healthy network means all stakeholders know their core roles but also accept roles that may be beyond their own interests and for the collective good during times of emergency. This type of flexibility is crucial to effective emergency response. 5. Enhance trust between all stakeholders. Trust is an essential component of networks. In several cases studies, Moynihan discovered that trust within collaborative relationships was the common theme in effective network governance during crisis responses. However, trust needs to be continuously facilitated due to the jurisdictional nature of emergencies. For example, if a fire department forgoes building trust-based relationships with other stakeholders, they may place individual organizational objectives far above network goals. The result would be vulnerable coordination and cooperation during a crisis which may lead to scattered command, lack of accountability and slower response. In other words, Moynihan emphasized that, within regional collaborations, “trust and working relationships” facilitated heightened coordination and resource allocation and reduced network conflict.